This article is designed to assist you with Automatic Tracking of Email Correspondence. extendedReach can automatically track your email correspondence (and attachments) with foster homes and child related contacts, thereby skipping the inbox step and filing directly into the case or home. This is accomplished by including an extendedReach system email address in your correspondence. When you send an email you wish to record, use the BCC (Blind Carbon Copy) field with this system email address. When you receive an email you wish to record, forward it to this email address. 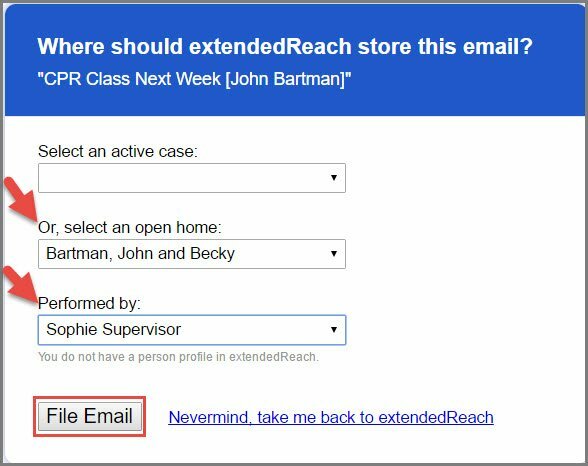 extendedReach automatically associates your email with the correct case or home. See the steps below for more information. Step #1. Your email must come from the email address associated with your extendedReach login (not your personal email) so the system identifies it’s validity. Step #2. BCC (Blind Carbon Copy) your system’s email address when you want to save a copy of the email you are sending. Each extendedReach system, has a unique email address assigned to it. The address is the system’s website prefix + “@erinbox.com”. You can see this website prefix when you are logged in to extendedReach (it is the word before “.extendedreach.com” in the website address. Step #3. Identify which case or home to associate the email with by referring to a Case or Home # in the subject line within brackets. 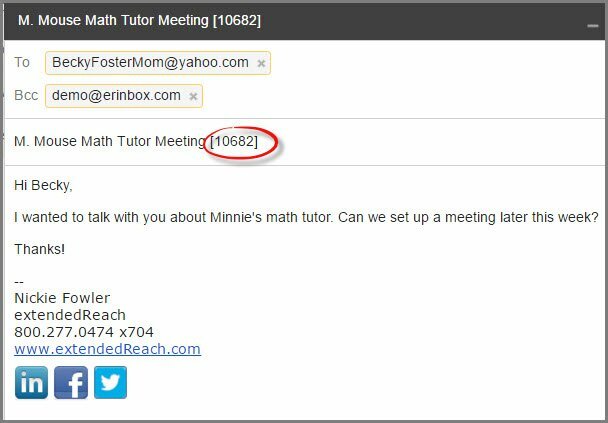 For cases, add the Agency Case Number(s) in brackets within the subject of the email. For homes, add the Agency Home Number(s) in brackets within the subject line of the email. If you don’t include brackets, eR will also look at the intended recipient(s) of the email and try to locate that (those) foster home(s) in extendedReach, based on a matching email address. Step #4. 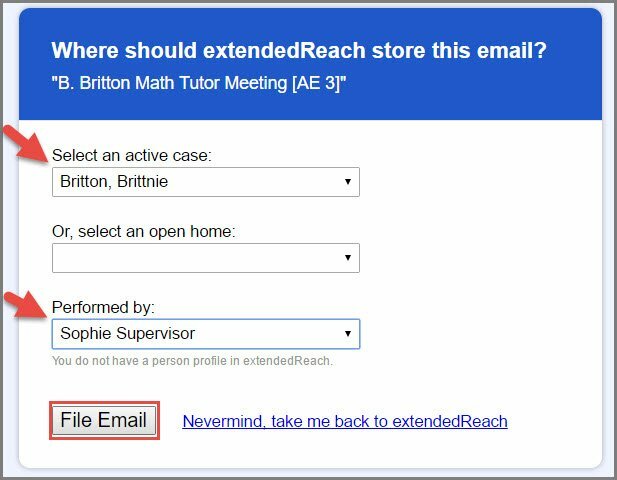 If the foster home or case cannot be located, or if the system couldn’t identify the validity of the sender’s email address, extendedReach will automatically reply asking you to manually match the email with a foster home. Click on the blue hyper-link in the email. Select the correct matches and click on “File Email”. Step #5. 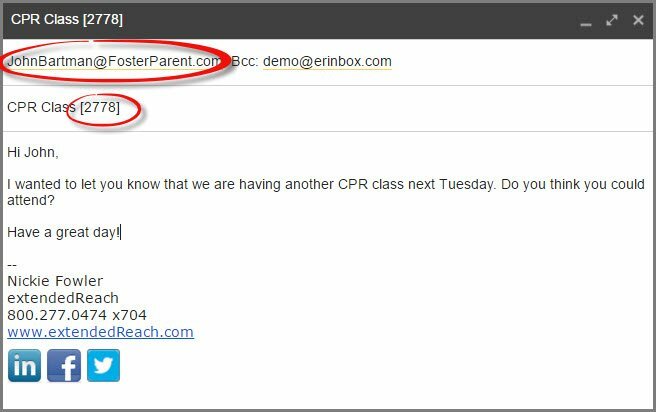 If the foster home or case is located, extendedReach will add a copy of the email to that case’s “Case File” or home’s “Home File” as an email activity.